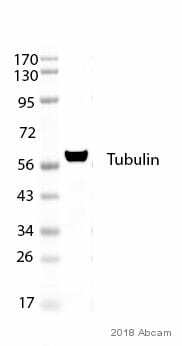 Rat monoclonal Tubulin antibody [YL1/2]. Validated in WB, IP, ELISA, IHC, RIA, Flow Cyt, ICC/IF and tested in Mouse, Human, Pig, Saccharomyces cerevisiae, Xenopus laevis and more. 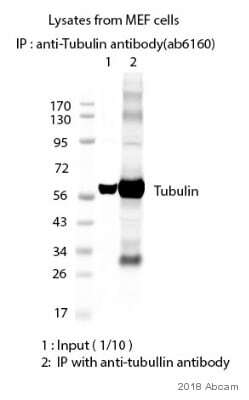 Full length native protein (purified) corresponding to Saccharomyces cerevisiae Tubulin. A linear sequence requiring an aromatic residue at the C terminus, with the two adjacent amino acids being negatively charged (represented by Glu-Glu-Tyr in Tyr-Tubulin). ICC/IF: HeLa cells. IHC-P: Human colon tissue. WB: HeLa, NIH/3T3, BALB/3T3 and PC-12 whole cell lysate. Flow Cyt: HeLa cells. This antibody can be used as a loading control on Western blots (Allen et al.) and is not detected by anti-mouse Ig secondaries. It has been used in epitope tagging procedures to detect proteins tagged with a C-terminal Gly-Gly-Phe(OH) epitope. 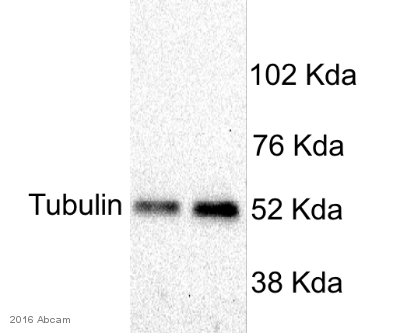 Under some circumstances this antibody may cross-react with other protein including E. coli rec A and oxidized actin. Our Abpromise guarantee covers the use of ab6160 in the following tested applications. ab18450 - Rat monoclonal IgG2a, is suitable for use as an isotype control with this antibody. IHC (Methanol fixed) 1/100. (from PubMed:16943269). Undergoes a tyrosination/detyrosination cycle, the cyclic removal and re-addition of a C-terminal tyrosine residue by the enzymes tubulin tyrosine carboxypeptidase (TTCP) and tubulin tyrosine ligase (TTL), respectively. Acetylation of alpha-tubulins at Lys-40 stabilizes microtubules and affects affinity and processivity of microtubule motors. This modification has a role in multiple cellular functions, ranging from cell motility, cell cycle progression or cell differentiation to intracellular trafficking and signaling. Immunocytochemistry/ Immunofluorescence - Anti-Tubulin antibody [YL1/2] (ab6160)Loison-Robert et al PLoS One. 2018 Jan 25;13(1):e0190014. doi: 10.1371/journal.pone.0190014. eCollection 2018. Fig 5. Cytoskeleton and major extracellular matrix proteins in human DPSC (Dental pulp stem cell) were analyzed by immunofluorescence. Vimentin and tubulin (Panel D, control, E, (BD) and F, (BR)) are shown. After 7 days in contact with/without the materials (Biodentine (BD) and Bioroot (BR)), coated coverslip cultures were fixed in PBS (pH 7.4) containing 4% paraformaldehyde/5% sucrose for 10 minutes. For detection of intracellular molecules, the cells on the coverslips were permeabilized using 0.5% Triton X-100. To block background staining, cells were treated with PBS containing 1% BSA/1% glycine at 37°C for 20 minutes. Samples were incubated with the primary antibody at 4°C overnight or at 37°C for 2 hours. For double immunostaining, primary antibodies were incubated as above. Samples were then incubated with the appropriate secondary antibodies at 37°C for 1 hour. Cell nuclei were stained using DAPI. Immunocytochemistry/ Immunofluorescence - Anti-Tubulin antibody [YL1/2] (ab6160)Shin et al PLoS One. 2014 Apr 10;9(4):e94708. doi: 10.1371/journal.pone.0094708. eCollection 2014. Fig 4. Egr3 localization is associated with microtubule organization in mouse oocytes. 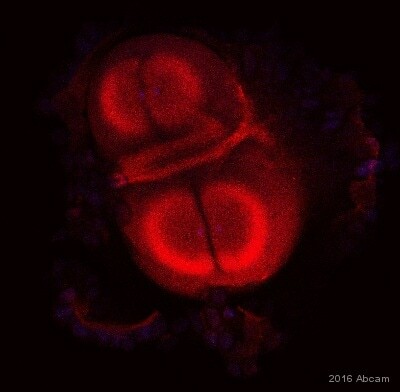 Mouse oocytes stained for Tubulin using ab6160 (Right panels, red) in ICC/IF. The localization of Egr3 and microtubule at thawing of vitrified oocytes. Vitrified MII oocytes were stored in LN2 for 2 weeks. Oocytes were taken out from LN2, incubated in decreasing concentrations of sucrose, and then fixed immediately. These oocytes were subjected to immunofluorescence staining with anti-Egr3 and ab6160 antibodies. Arrows indicate the growing arrays of microtubules at the site of Egr3 accumulation. ICC/IF image of ab6160 stained HeLa (Human epithelial cell line from cervix adenocarcinoma) cells. The cells were fixed in 100% methanol 5 minutes, permeabilized with 0.1% Triton X-100 for 5 minutes and then incubated in 1% BSA / 10% normal goat serum / 0.3M glycine in 0.1% PBS-Tween for 1 hour to block non-specific protein-protein interactions. The cells were then incubated with the antibody (ab6160, 1/1000 dilution) overnight at +4°C. The secondary antibody (green) was ab150165 Alexa Fluor® 488 goat anti-rat IgG (H+L) pre-adsorbed, used at a 1/1000 dilution for 1 hour. 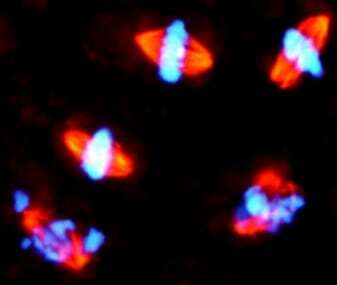 DAPI was used to stain the cell nuclei (blue) at a concentration of 1.43µM. This product also gave a positive signal under the same testing conditions in HeLa cells fixed with 4% formaldehyde (10 minutes). IHC image of Tubulin staining in human colon formalin fixed paraffin embedded tissue section*, performed on a Leica Bond™ system using the standard protocol F.
The section was pre-treated using heat mediated antigen retrieval with sodium citrate buffer pH 6 for 20 minutes. The section was then incubated with ab6160, 5 µg/ml, for 15 minutes at room temperature and detected using an HRP conjugated compact polymer system. DAB was used as the chromogen. The section was then counterstained with haematoxylin and mounted with DPX. Overlay histogram showing HeLa (Human epithelial cell line from cervix adenocarcinoma) cells stained with ab6160 (red line). The cells were fixed with 80% methanol (5 minutes) and then permeabilized with 0.1% PBS-Tween for 20 minutes. The cells were then incubated in 1x PBS / 10% normal goat serum / 0.3M glycine to block non-specific protein-protein interactions followed by the antibody (ab6160, 1 µg/1x106 cells) for 30 minutes at 22ºC. The secondary antibody used was DyLight® 488 goat anti-rat IgG (H+L) (ab98386) at 1/500 dilution for 30 minutes at 22ºC. 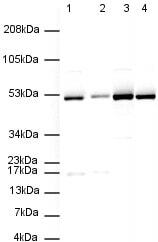 Isotype control antibody (black line) was rat IgG2a [aRTK2758] (ab18450, 1 µg/1x106 cells) used under the same conditions. Acquisition of >5,000 events was performed. Observed band size: 52 kDa why is the actual band size different from the predicted? Additional bands at: 17 kDa, 34 kDa, 80 kDa. We are unsure as to the identity of these extra bands. Immunocytochemistry/ Immunofluorescence - Anti-Tubulin antibody [YL1/2] (ab6160)This image is courtesy of an Abreview submitted by Stephanie Chrysanthou. ab6160 staining Tubulin in mouse trophoblast giant cells by ICC/IF (Immunocytochemistry/Immunofluorescence). Cells were fixed with methanol and blocked with 0.5% BSA for 30 minutes at 20°C. Samples were incubated with primary antibody (0.5% BSA, 0.1% Tween-20 PBS) for 1 hour at 20°C. An Alexa Fluor® 568 polyclonal Goat anti-Rat IgG (H+L) Cross-Adsorbed (1/750 dilution) was used as the secondary antibody. ab6160 staining Tubulin in mouse MEF cells by Immunocytochemistry/ Immunofluorescence. Cells were fixed with 2% PFA and 96% Ethanol. Samples were incubated with primary antibody (1/2000 in 0.1% Saponin/1% BSA/PBS) for 1 hour. A Cyt3®-conjugated goat polyclonal to rat IgG (H&L) was used at dilution at 1/500 as secondary antibody. Red staining in the image represents Tubulin, whereas the green one resembles gamma-tubulin. ab6160 staining mouse prostate tissue sections by IHC-P. The tissue was serial sectioned at 6 microns, formaldehyde fixed and subjected to heat mediated antigen retrieval prior to blocking in 3% peroxidase for 5 minutes at 27°C. The primary antibody was diluted 1/500 and incubated with the sample for 16 hours at 4°C. 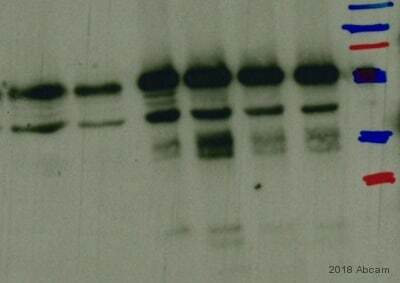 A Cy5® conjugated goat anti-rat antibody was used as the secondary. 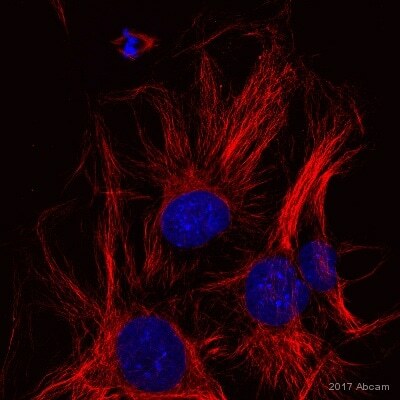 Immunocytochemistry/ Immunofluorescence - Anti-Tubulin antibody [YL1/2] (ab6160)This image is courtesy of an anonymous Abreview. ab6160 at 1/1000 dilution staining Tubulin in human WBC cells by Immunocytochemistry/ Immunofluorescence. Cells were fixed in acetone and then blocked in 5% serum for 1 hour at 25°C. No permeabilization was done. The primary antibody was used at 1/1000 dilution in PBS-Tween and incubated with sample at 4°C for 16 hours. An Alexa Fluor® 594 conjugated goat polyclonal to rat IgG was used as secondary at 1/500 dilution. This image was kindly supplied as part of the review submitted by Marko Kallio. 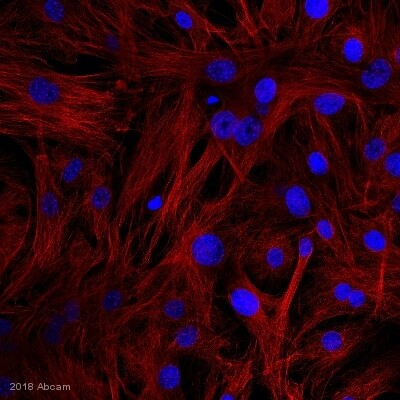 ab6160 was used for immunofluorescence on male rat testis samples in order to visualize microtubules of meiotically deviding cells. The samples were fixed with 2% paraformaldehyde and 0.8% glutaraldehyde and the antibody was used at a dilution 1:2500 (red - tubulin, blue - DNA stained with DAPI). Immunohistochemistry (Frozen sections) - Anti-Tubulin antibody [YL1/2] (ab6160)This image is courtesy of an anonymous abreview. ab6160 at a 1/200 staining Tubulin in mouse liver tissue sections by Immunohistochemistry (frozen sections) incubated for 9 hours at +4°C. Fixed in formaldehyde, permeabilized using 0.2% Triton X-100. Blocked using 2% BSA for 30 minutes at 20°C. Secondary used at a 1/200 dilution polyclonal Goat anti-rat IgG conjugated to Alexa Fluor® 555. Publishing research using ab6160? Please let us know so that we can cite the reference in this datasheet.